Valentina Carretta was born in Treviso, Italy, in 1981. She is a graduate of the Politecnico di Milano in 2006. 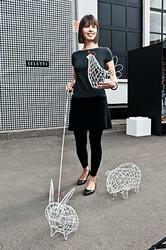 In 2005, she began the collaboration with the Fabrica Design Department. Since 2008, she also has been running her personal work as a freelance designer, dealing mainly with product design, interior design and art direction. Her projects include collaborations with brands such as Seletti, Roche Bobois, Bosa, Miniforms and Fabrica Features, as well as limited editions pieces for Zanotta, Galleria Secondome and Granville Gallery. Her work is intended to be a language that investigates daily habits, customs and memories.